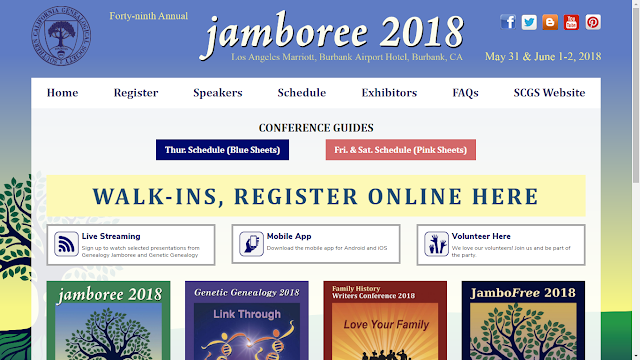 This is a genea-blog compendium for the Southern California Genealogical Society Genealogy Jamboree 2018 at the Los Angeles Marriott Burbank Airport Hotel and Convention Center. I will update this post several times a day as time permits. If you have written a blog post about your activities at Jamboree, please let me know in a comment on this blog and/or in an email. 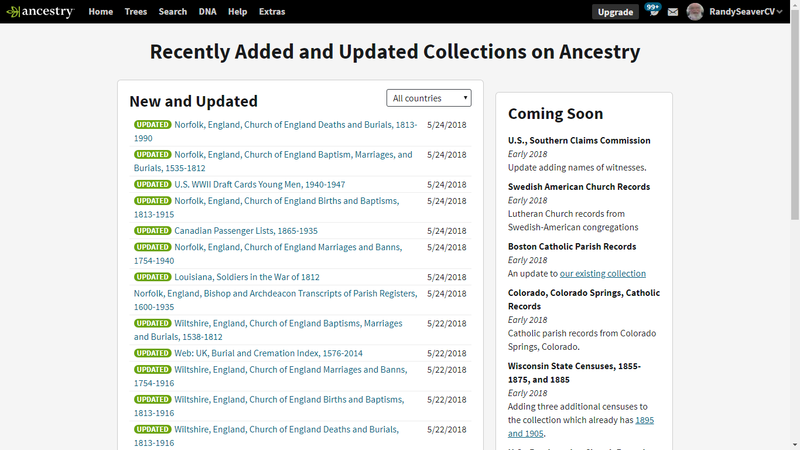 1) What was your best genealogy "research find" in May 2016? It could be a record, it could be a photograph, etc. Whatever you judge to be your "best." 2) Tell us about it in a blog post of your own, or in a comment to this blog post, or in a Facebook or Google+ post. 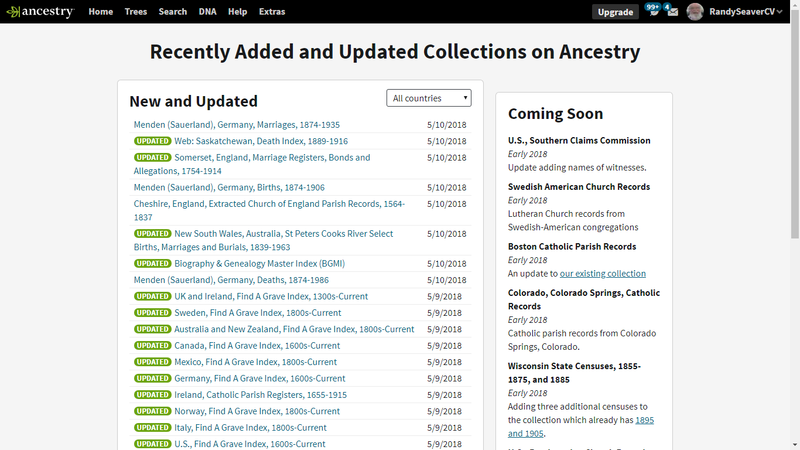 I am crafting a genealogy presentation titled "Discovering George W. Seaver's Life Story" and did a search for more records for George (you may recall that he was the guy who ran away from his wife in 1899 - a list of blog posts is in The Rest of the George W. Seaver Story - Part VIII: More Family Information (posted 20 March 2018)). 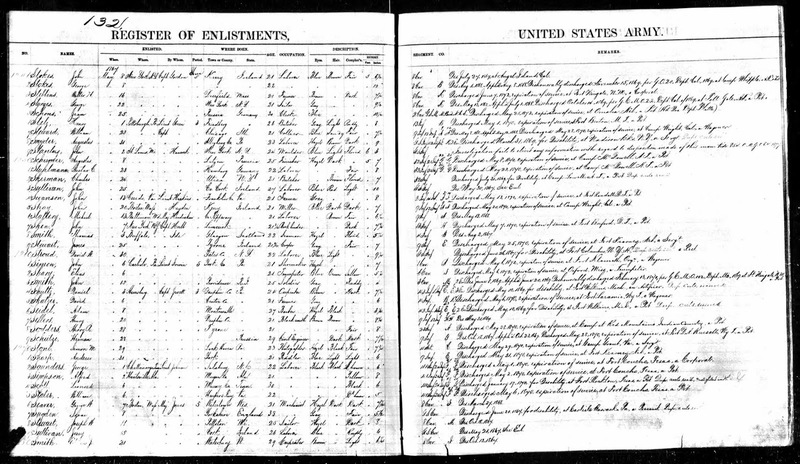 I found that after he was discharged from the 2nd Massachusetts Heavy Artillery regiment that he enlisted in the United States Army in 1867, and was discharged in 1768. From this, I learned that he enlisted in the U.S. Army 8th Cavalry, company I on 7 May 1867 in Boston and was discharged on 27 March 1868. Also, this is the only record I've found that provides a birth place of Watertown, Wisconsin. He was age 21 (actually 19 when he enlisted), and was a machinist. He had hazel eyes, dark hair, a dark complexion, and was 5 feet 7-1/4 inches tall. 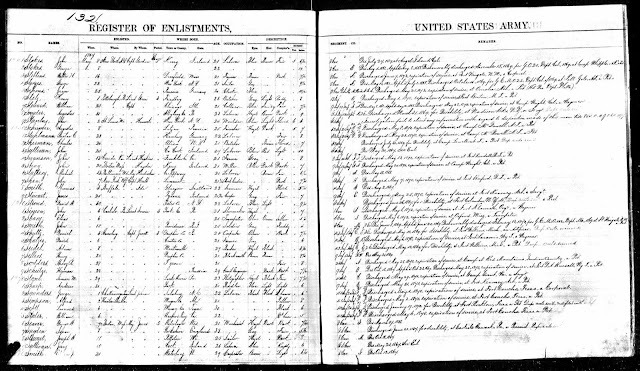 "U.S. Army, Register of Enlistments, 1798-1914," digital image, Ancestry.com (http://www.ancestry.com : accessed 11 May 2018), 1867 > P-Z, image 104 of 252, no. 1076, George W. Seaver entry. 2122. Samuel Rice, born before 12 November 1634 in Berkhamsted, Hertfordshire, England; died 25 February 1685 in Marlborough, Middlesex, Massachusetts, United States. He was the son of 4244. Edmund Rice and 4245. Thomasine Frost. He married 08 November 1655 in Sudbury, Middlesex, Massachusetts, United States. 2123. Elizabeth King, born about 1635 in Shaftesbury, Dorset, England; died 30 October 1667 in Marlborough, Middlesex, Massachusetts, United States. * Elizabeth Rice (1656-1727), married 1677 Peter Haynes (1654-1748). * Edmund Rice (1663-1726), married 1692 Ruth Parker (1665-1726). 4246. Thomas King, born about 1600 in Shaftesbury, Dorset, England; died before 24 March 1676 in Marlborough, Middlesex, Massachusetts, United States. He married about 1624 in Shaftesbury, Dorset, England. 4247. Anne LNU, born about 1600 in England; died 24 December 1642 in Sudbury, Middlesex, Massachusetts, United States. * Anna King (1625-1698), married 1646 William Kerley (1604-1683). * Peter King (1628-1704), married Sarah Rice (1635-1706). * Mary King (1630-1715), married 1651 Thomas Rice (1626-1681). * Sarah King (1632-1706), married 1656 Nathaniel Joslin (1627-1694). * Elizabeth King (1635-1667), married 1655 Samuel Rice (1634-1685). * Mercy King (1638-1669), married 1658 Joseph rice (1638-1711). * George Arthur Davis, Davis and Fifty Allied Families of New England (Augusta, Me. : Kennebec Journal, 1956). I have done no original research on this King line. 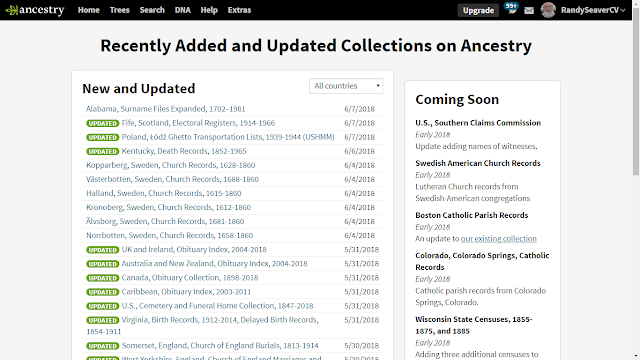 * June Update: GenealogyBank Just Added New Content from 70 Titles! 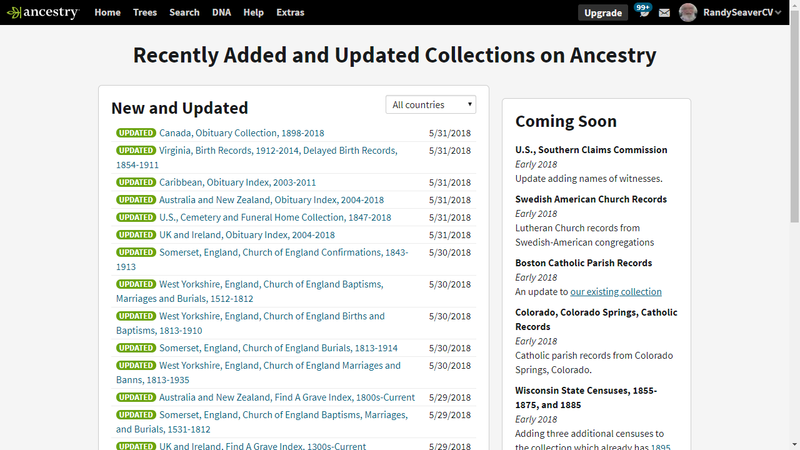 Did you miss the last Genealogy News Bytes - 5 June 2018? Benjamin Wing (1698-before 1782) is #354 on my Ahnentafel List, my 6th great-grandfather, who married #355 Content Tucker (1695-before 1739) in 1722 in Dartmouth, Bristol County, Massachusetts. * their daughter #177 Abigail Wing (1734-1806) who married #176 Jonathan White (1732-1804) in 1756. * their son, #88 Humphrey White (1757-1814) who married #89 Sibel Kirby (1764-1848) in 1786. * their son, #44 Jonathan White (1803-1850) who married Miranda Wade (1804-1850) in 1824. * their son #22 Henry Arnold White (1824-1885) who married Amy Oatley (1826-1864) in 1844. Benjamin Wing was born 1 February 1698 in Dartmouth, the second child of Matthew and Elizabeth (Mott) (Ricketson) Wing[1-2]. Like his parents, Benjamin was a member of the Apponnegansett Meeting of Friends in Dartmouth during his life. "Benjamin Wing, s. Matthu of D., and Content Tucker, d. Abraham of D., 18th, 8 mo., 'called October,' 1722." Content was born in Dartmouth, and was the daughter of Abraham and Hannah (Mott) Tucker. They had five children between 1722 and 1734. Content died before October 1739. He married, secondly, to Rhoda Rogers in Pembroke, Plymouth, MA on 19 October 1739. Rhoda was born in Marshfield, Plymouth County, Massachusetts on 25 May 1713, the daughter of Thomas and Bethia (Ewell) Rogers. They had five children between 1740 and 1750. Rhoda died 21 April 1758 in Dartmouth at 44 years of age. "Benjamin Wing, s. Mathew and Elisabeth both dec'd of D., and Mary Potter, wid. Nathaniel of D., 6th 12 mo. 1764." Mary was born in Dartmouth, on 3 April 1705, the daughter of Joseph and Mary (Soule) Devol. Mary died on 5 November 1798 in Westport, Massachusetts, at 93 years of age. They had no children. "I Give to my Son Benjamin his heirs and assignes all that parte of my homesteed that was Timothey Ricketson Deceased and the housing Standing upon Said Land, Together with all my addition Land ajoyning to the East End of it; also one acre of Land To the Northward of my orchard Beginning in the South Line of that Land that I bought of Kerbee, and on the East side of my orchard aforsaid by a Stone wall thence North forty three Degrees west Seven Rods & Six feet to a Stake thence west Twenty Six degrees South Twenty Rods to white oke Tree marked, thence South Twenty three Degrees East to the Line first mentioned; also all the meadow Lying att the foot of his Land, by the River; also to have a way through Josephs Land to that way att the head of his Land; also all the meadow Lying in a flat a Little of the Norward of Ship Rock flat; also all my meadow Lying in Soule flats, also all my meadows Lying in the North End of the Grate Island; and also all my Right in meadow Lying att pechiechwet and also the one half of my Cedar Swamp ajoyning to that Land that I Bought of Leanders; also one acre and half and Ten Rods of the Cedar Swamp Lying above Shearmans Bridge adjoyning Robert Kerbes Cedar Swamp. "Item. I Give to my Two Sons Joseph & Benjamin, whome I constitute make and ordaine my Executors of this my Last will and Testament all that Land I Bought of Landers Together with the Addition Lands ajoyning to it to be Equally Devided Between them according to quantity & Quality." Benjamin Wing wrote his will on 5 November 1776, and he wrote a codicil on 2 April 1779. The will and codicil were proved on 7 May 1782. "Imprimus I Give & Bequeath unto my beloved wife Mary Wing the use & improvement of the best Room in my dwelling house with a Privilege with a Celler, oven for Baking & the well for drawing Water with full Liberty to pass & Repass to & from the same, also a Privilege to Set a bed in the chamber of my said House, and a Privilege in the Leenter Chamber, also one hundred pounds of Beef, one hundred Pounds of Pork, Twelve Pounds of Sugar, Six Gallons of Molasses Seven Bushells of Good Indian Corn, Three Bushells of Rye, fourteen pounds of Flour, Ten pounds of Good Sheeps wool & ten pounds of Flax from the Swingle, also Seven Cord of Good fire wood brought to her door and cut Suitable for her fire, and one pound four shillings Lawfull money to purchase Small stores for her use, and all to be Provided yearly & Every year during the time she shall Remain my widow. I also Give to my said wife two Cows & one Horse & their Keeping ^Except one Cow^ on my Home Stead Farm winter & Summer as the other Creatures on sd Farm are Kept, also the Keeping a Pig, two Geese & three Hens with the Increase of the Geese & Hens from spring to fall, also the Privilege of Planting for Sauce a Quarter of an Acre of Land in some Convenient place for her use, with the fruit that shall Grow on the North Row of apple Trees in my Little Orchard Standing by the wall, all the above Provisions & Privileges are to be paid Delivered to & Provided for my said wife yearly by my four Sons Namely Benjamin, David,Jonathan & Prince Equally between them during the time she shall Remain my widow, Excepting however, and it is my will that the Keeping of the Creatures & Providing the fire Wood above Said shall be done Equally by my Sons David & Prince & by them only, and the Improvements Above given to my wife in my House, orchard & Sauce yard as above said to be on that part that I shall give in this my will to my son Prince, but the Cows and Horse above Given to ^my^ sd wife to be taken out of my Stock that I shall Leave at my decease. "Item I also Give unto my said wife all the House hold Goods (that is Remaining at my decease) that belonged to her when I married her and were brought to my House, Together with all the household Goods that we Commonly use or that we shall have in Possession at my decease Excepting two Silver Spoons. "Item And my will farther is & I hereby order my two sons David and Prince to Provide my said wife with a Suitable Nurse & good Tendance in time of Sickness & old age when needed during the aforesaid Term if she shall see cause to Live in my House & Improve the Privileges above Given to her. But if in case my said wife should be Inclined to Lett or hire out the above Privilege & Improvements or any part thereof my will & meaning is that she shall nor hire them to be Improved by any but to my sons only if they see cause to hire the same, and the Price thereof to be by them mutually agreed upon, or be set & prised by Indifferent men by them Chosen, and all the above & foregoing Gifts & Privileges I do Give to my said wife in Lieu of her Right of dowry or Thirds in my Estate and I desire she may Accept of them Accordingly. "Item I Give & Bequeath unto my son Benjamin Wing & to his heirs & assigns forever all the Remaining part of that Farm which I bought of David Wilkason in Smithfield which I have not already heretofore Conveyed or Given to him by Deed of Sale or Gift, with all the Privileges & Appurtenances thereunto belonging, together also with the one half part of that Cedar Swamp Lot Situate in said Smithfield which I bought of Daniel Smith he my said son Benj^a paying one Quarter part of all my debts & Charges of Settling my Estate and otherwise performing what I have herein ordered & directed him to do & fulfil. "Item I Give & Bequeath unto my Son Thomas Wing & to his heirs Nine pounds Lawful Money to be paid by my four sons Namely Benjamin, David, Jonathan & Prince Equally within three years next after my decease. "Item I Give & Bequeath unto my two Sons David & Jonathan & to Their Heirs and Assigns forever a Tract or piece of Salt Meadow Laying hear the head of the Lott so called situate in Dartmouth it being all the Meadow which I bought of Increase Allen, to be Equally Divided between them my sd two sons. "Item I Give & Bequeath to my two sons David & Prince & to their Heirs & Assigns forever Equally to be Divided between them a piece of Salt Meadow situate in Accoakset River in sd Dartmouth it being a flatt called Gunning Flatt or Sowle's flatt. "Item I Give to my son Prince and to his Heirs & Assigns forever two parcels of Salt Meadow Laying in sd Coakset River on the Northward Side of the Great Island so-called. "Item I Give to my Son Jonathan Wing & to his Heirs & Assigns forever one half part of that Cedar Swamp which I bought of Daniel Smith Situate in Smithfield aforesaid, he performing what I have ordered him to pay & perform in this my will. "Item I Give & Bequeath unto my son David Wing & to his Heirs & Assigns forever the Southerly half or part of my Homestead farm Bounded off from the Northerly part thereof as followeth: Beginning at a Cherry Tree near the Edge of the Salt marsh at the foot of my said farm from thence to Extend West to the sd River, Again to Extend from said Tree East twenty Seven degrees North fifty two Rods & 6 foot to a Butter-wood Tree Marked Standing by another tree of the same sort, from thence to Extend East fifteen dgs North to the head line of my said farm he my said son David paying fulfilling & performing as I have & Shall order & direct in this my will. "Item I Give & Bequeath unto my son Prince Wing & to his Heirs & Assigns forever the Northerly half or part of my said homestead farm bounded off from the Southerly part thereof as above described, with all the Buildings thereon & Privileges & Apportenances thereto belonging he my said son Prince allowing his mother-in law the Privilege & Improvements as I have Given her in this my will & otherwise perform as I have and shall order & direct in this my will. "Item I also Give unto my son Prince & to his Heirs & Assigns forever a parcel of Salt meadow Laying at a place Called P. Schsuit in sd Accoakset River joining to Peleg White's Land. "Item I give unto my two sons David & Prince all my Live Stock of all Kinds Except what I have already otherwise disposed of within my will together with all my farming tools & Utensils with all my debts due to me by bond book or otherwise and they my said sons David & Prince to pay Three Quarter parts of all my just just debts funeral charges & Expences of Settling my Estate. "Item I Give to my three sons David Jonathan & Prince all my Pewter Marked with the Letters I H W also a small Brass Kettle. "Item I Give to my Daughter Rhoda Tucker Sixty Shillings Lawful Money. "Item I Give to my four Grand-Children, the Children of my Late deceased Daughter Hannah Davis Namely Thomas, Rhoda, Benjamin & Anna to each of them the Sum of Ten Shillings Lawful Money. "Item I Give to my Grandson John Wood Six pence and to my Grand daughter Content Sowle Six pence besides what I have already Given to their Mother deceased. "All the above Legacies to my Daughters & Grand Children are to be paid within two years next after my decease by my four sons Namely Benjamin David Jonathan & Prince Equally between them. "Lastly I Give to my two Sons David & Prince all my Wearing Apparel with all my Silver Buttens Equally Between them Together with all the Rest & Residue of my Estate of all Kinds not otherwise disposed of in this my will to be Equally Divided between them their Heirs & Assigns forever. "And I do hereby Constitute & Appoint my two sons Namely Benjamin & David to be Joint Executors to this my Last Will & Testament to see the same fulfiled in Every part according to the True Intent & meaning thereof, hereby Revoking all other Wills by me before this time made declaring this only to be my Last Will & Testament. In Witness whereof I have hereunto set my Hand & Seal This fifth day of the Eleventh month Called November A.D. One Thousand Seven hundred & Seventy Six 1776. "Be it Known to all People by These Presents That I Benjamin Wing of Dartmouth in the County of Bristol in New England yeoman Have made & declared my Last Will and Testament in Writing bearing date the fifth day of the Eleventh Month Called November A D 1776. Wherefore, I the said Benjamin Wing do hereby Ratify and Confirm all and Every article & Clause therein Contained Except the following alterations,(viz) That whereas my Daughter Elizabeth Howland is now deceased Since the writing of my said Will I do therefore hereby Give and Bequeath unto her fourteen Children Namely, Susanna, John, Content, James, Sarah, Wing, Timothy, Rebeca, Warren, Benjamin, Jonathan, David, Amy and Elisabeth all that which is Mentioned in my said Will to be Given to their mother to be Equally Divided to & between them her said Children, or to the Survivors of them at my decease. "Furthermore My will is that my son Benjamin Wing pay unto my two sons David and Prince Equally between them One hundred & fifty Silver Spanish mill^d Dollars or the Value thereof in other Silver or Gold with the Interest thereupon from this Present date until the Same be paid, the same being his part or Proportion of my Debts which they my sd sons David & Prince hath already paid & discharged. "Item my will farther is That if Either one or more of my sons shall Bring or Exhibit any Book debt or account Against me or my Estate after my decease in order to Recover the same out of my Estate I do hereby order the same to be paid & discharged out of his part or that part of my Estate that I have in my said will Given unto him or them Respectively so Exhibiting such account as aforesd. "Item my Will & meaning farther more is that all & Each one of the money Legacies that I have ordered to be paid in my said Will That the same be paid in Silver Money at the Rate of Six Shillings & Eight Pence per Ounce or the Equall Value thereof in Gold. "Finally I do hereby Ratify & Confirm this Present Codicile to be part and parcel of my Last Will & Testament and that Everything herein Contained be Truly & faithfully fulfil^d & Performed. "In witness whereof I have hereunto set my hand & seal this Second day of the fourth month A D one Thousand Seven hundred & Seventy Nine. The codicil and will of Benjamin Wing was proved by the Bristol County Probate Court on 7 May 1782. "Bristol, May 7^th 1782 Then before the Hon^ble Benjamin Williams Esq. Judge of the Probate of Wills &c for the County of Bristol came Thomas Howland and Samuel Smith two of the witnesses to the before written instrument and made oath that they were present and saw Benjamin Wing the subscriber thereto who is since deceased sign seal and heard him publish and declare the same to be a codicil to his last Will and Testament and to be part and parcel thereof and that he was of a sound and disposing mind and memory when he so did and that they with Charles Howland signed as witnesses at the same time and all in the presence of the Testator. There are no death or burial records for Benjamin Wing. 1. Massachusetts, Town and Vital Records, 1620-1988, digital images, Ancestry.com (http://www.ancestry.com), "Dartmouth, Births, Marriages, Deaths," page 187 (image 97 of 2331), Benjamin Wing entry. 2. Vital records of Dartmouth, Massachusetts, to the year 1850 ( Boston, Mass. : New England Historic Genealogical Society, 1929-1930), Births, page 305, Benjamin Wing entry. 3. "Probate Records, 1687-1916; Index, 1687-1926" Bristol County, Massachusetts, Probate Court Records, on 199 FHL US/CAN Microfilm rolls; original records at Probate Registry, Taunton, Mass., Volume 4, Pages 332-334, Matthew Wing probate records, on FHL Microfilm US/CAN 0,461,882. 4. Vital records of Dartmouth, Massachusetts, to the year 1850, Marriages, page 553, Benjamin Wing and Content Tucker entry, 1722. 5. Massachusetts, Town Records, 1620-1988, digital images, Ancestry.com (http://www.ancestry.com), "Pembroke, Records of Slaves Granted Freedom, With Births, Marriages and Deaths," page 68 (image 81 of 122), Benjamin Wing and Rhody Rogers marriage entry. 6. Vital records of Dartmouth, Massachusetts, to the year 1850, Marriages, page 554, Benjamin Wing and Mary Potter entry, 1764. 7. 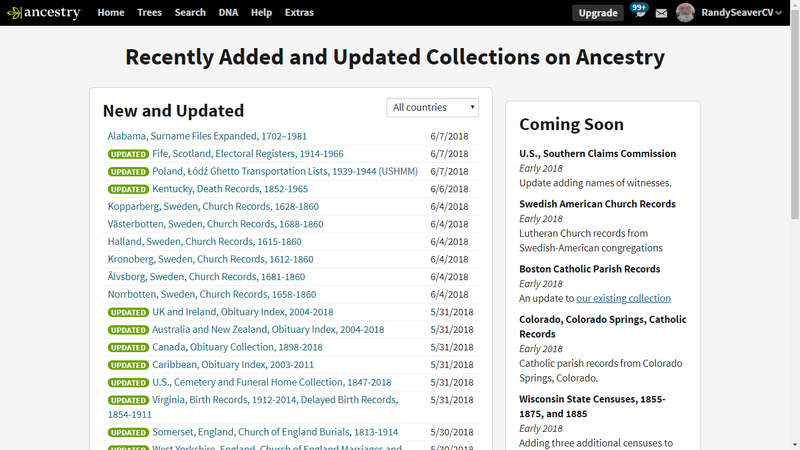 "Massachusetts, Wills and Probate Records, 1635-1991," indexed database with digital images, Ancestry.com (http://www.ancestry.com), Bristol County, "Probate Records, Wilmarth, Walter - Wing, James," 7 pages (images 1214-1220 of 1488), Benjamin Wing, 1782 estate papers; original papers at Bristol County (Mass) Probate Court, Taunton, Mass.